This image shows the pattern of mycorrhization in a root of Maianthemum racemosum (False Solomon’s Seal), a plant of rich, mesic forests in the northeastern USA. In eastern deciduous forests, 60-74% of herbaceous plants regularly exhibit colonization by arbuscular mycorrhizal fungi (AMF) (McDougall and Liebtag 1928; Brundrett and Kendrick 1988). Mycorrhizal symbioses improve plant assimilation of phosphorus (P) and nitrogen (N) (e.g. Baylis 1959; Holevas 1966; Johansen et al. 1992; Frey and Schüepp 1993; Van der Heijden et al. 1998; Hodge et al. 2001). Many woodland herbs form air channels in the roots to improve gas exchange and these structures are also thought to facilitate colonization by AMF (Brundrett and Kendrick 1988). Often these plants have soft, thick roots that either lack root hairs or have short, sparse root hairs (magnolioid-type) and are thus more dependent on AMF for P uptake in mature forest soils (Baylis 1975). As seen in the image above, an external hypha gives rise to a structure call an appressorium (Ap) which penetrates a short cortical cell and forms a hyphal coil (C). From there the fungus eventually enters air channels and spreads along length of root. The fungus can produce lipid-rich structures called vesicles (V) to store energy. Examination of fungal features in plant roots is facilitated by first clearing them in a solution of KOH (potassium hydroxide). 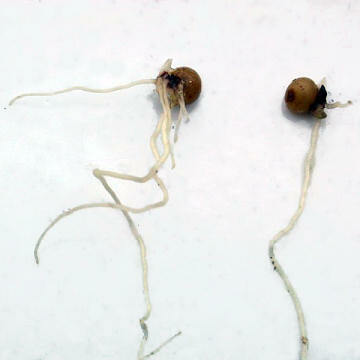 The roots can then stained using Chlorozal Black E to improve contrast (Brundrett et al. 1996). The seedlings of False Solomon’s Seal (below) exhibit epicotyl dormancy (a type of double-dormancy); following the first winter, the radicle emerges and the seedlings establishes a modest root system and a small shoot tip during the first growing season. The shoot does not emerge until the following spring, which means that for the first year of growth no photosynthesis takes place in the seedling. Baylis, G.T.S. 1959. 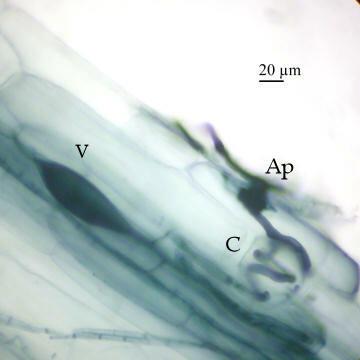 Effect of vesicular-arbuscular mycorrhizas on growth of Griselinia littoralis (Cornaceae) New Phytologist 58(3):274-280. Brundrett, M.C. and B. Kendrick. 1988. The mycorrhizal status, root anatomy, and phenology of plants in a sugar maple forest. Canadian Journal of Botany 66:1153-1173. Brundrett, M.C., N. Bougher, B. Dell, T. Grove and N. Malajczuk. 1996. Working with mycorrhizas in forestry and agriculture. The Australian Centre for International Agricultural Research. Monograph, Canberra, Australia. 375p. Frey, B. and H. Schüepp. 1993. The role of vesiculararbuscular (VA) mycorrhizal fungi in facilitating inter-plant nitrogen transfer. Soil Biology and Biochemistry 25:651-658. Hodge, A., C.D. Campbell and A.H. Fitter. 2001. An arbuscular mycorrhizal fungus accelerates decomposition and acquires nitrogen directly from organic material. Nature 413:297-299. Holevas, C.D. 1966. The effect of a vesicular-arbuscular mycorrhizal on the uptake of soil phosphorus by strawberry (Fragaria sp. var. Cambridge Favorite). Journal of Horticultural Science 41:557-64. Johansen, A., I. Jakobsen and E.S. Jensen. 1992. Hyphal transport of N-15-labeled nitrogen by a vesicular-arbuscular mycorrhizal fungus and its effect on depletion of inorganic soil-N. New Phytologist 122:281-288. McDougall, W.B. and C. Liebtag. 1928. Symbiosis in a Deciduous Forest. III. Mycorhizal Relations. Botanical Gazette 86(2):226-234.